I once saw a hilarious depiction of the five types of moms you meet: The PTA mom, Parenting Expert, Crunchy Mom, Hipster Mom, and (my favorite) Hot Mess Mom (see the video below). Despite my best efforts, I identify with the Hot Mess Mom racing to the meeting with stains on her shirt and yesterday’s hairdo going in every direction – which is why you need to know these homemade baby food hacks I’m going to share AREN’T just for the uber-crunchy, hipster, always-put-together moms. You and me, on our worst days, can pull these DIY hacks off, mama. I guarantee it. When my daughter was born in 2013, we were slightly broke. We let go of my full-time income and benefits after my transition to a part-time position, and our health insurance plan went through the roof. My husband supported us while I supplemented our income doing childcare, consignment sales, and eventually, launched a career from home as a freelance writer. Throughout that journey, frugal living became a mandate in our home. When I began researching ways to cut costs with an infant, I realized even a “Hot Mess Mom” like me (which, I’m convinced we’re all a hot mess on any given day – which makes us fabulous) could start doing DIY hacks in my home. Baby food was a huge win. 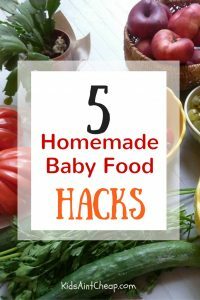 Besides breastfeeding for a full year, making homemade baby food was probably the largest money saver we unearthed (cloth diapers are also a great way to save money – but we rented our home and didn’t want to ruin the landlord’s washing machine…). I’m no pediatrician, so please don’t assume this will be the case for you, but when the doctor says to start feeding your child solids when she’s six months old, you may do well to wait. Babies have their own timeline, and as long as they’re receiving full meals via breast milk or formula, they have the nutrients they need before their first birthday. “Food before one is just for fun,” as they say. You could save tons of money by simply following your baby’s lead instead of forcing her to eat solids too early. When my son spit out every morsel of baby food I offered at six months, I got the hint to chill out. He was in the 98th percentile for height and weight entirely from consuming breast milk and refused solids until he was 11 months old. The doctor’s only concern after I explained my son’s lack of interest was that he continue learning his motor movements with a spoon or fork. So I gave him plastic ware to tinker with in his high chair during our meals, and he loved it. Every baby is different, though. When my daughter turned six months old, she watched my plate of food like a shark. I introduced her to solids shortly after that and she devoured them, happily. Don’t feel the pressure to force your baby to eat solids if he’s not digging it, yet. Making homemade baby food feels like a huge undertaking at first with cooking, pureeing, freezing, and labeling everything. It can, however, begin more simply. Try some superfoods that are basically ready to eat, like a banana, avocado, or peach. You don’t have to start with peeling, gutting, and broiling a gigantic butternut squash (although, once you’ve gotten your feet wet, it’s extremely healthy for your baby and not as harrowing as it sounds!). 3. Introduce one new food at a time. To avoid the risk of allergies, it’s wisest to only introduce your baby to one new food at a time. You may think Tiger needs more variety and that you aren’t being kind by feeding him any other solids except softened carrots, but he’s doing fine. Babies’ taste buds are developing and each new flavor, no matter how bland, is a vibrant experience to them. 4. You don’t have to use the fancy, expensive equipment. Sure, companies have produced the perfect gizmos for homemade baby food hacks, but you don’t have to have them. Go ahead and register for a brand new Ninja or Magic Bullet, as well as baby food freezer trays that come with a lid. If, however, you don’t receive them or don’t have the money to buy them right now, your existing blender, some ice cube trays, tin foil and a Sharpie did the trick for me. 5. DIY when it makes sense. The pouch is designed to be mess-free, can be stored anywhere before it’s opened, and exposes children to healthy foods they might not otherwise eat. All for $1 to $2 each. With coupons, I can easily get each pouch for less then $1.50. The thing is, you can do all of that from home if you want. You can buy reusable pouches that look extremely challenging to clean, as well as those unique ingredients like organic purple carrot or amaranth. Then, you can cook and puree each one individually and fill your snack pouches with any combination you want. I need a nap just from typing all of that. For a $1, it’s worth it for me to simply buy the snack pouch (sorry, environment). Do the DIY thing when it makes sense. Don’t beat yourself up if your friend serves her family home-grown, organic rutabaga, kale and goat cheese for every meal. Start where you can and remember: Fed is best. Simple as that. What are some homemade baby food hacks you’d like to share? Tell us in the comments below!